The following account of the life of John Rogers of Dedham, Essex, by Alexander Gordon is quoted in full from the Dictionary of National Biography (vol. 17, pp. 129–30). John Rogers is my tenth-great-grandfather through his son, the Massachusetts immigrant Rev. 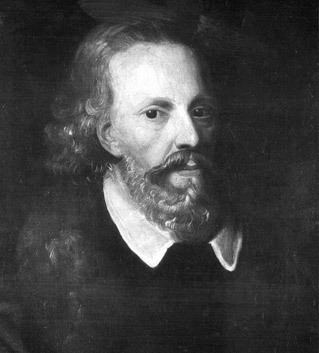 Nathaniel Rogers (abt1598–1655) of Ipswich, Massachusetts. Rogers, John (1572?–1636), puritan divine, a native of Essex, was born about 1572. He was a near relative of Richard Rogers (1550?–1618) [q.v. ], who provided for his education at Cambridge. Twice did the ungrateful lad sell his books and waste the proceeds. His kinsman would have discarded him but for his wife’s intercession. On a third trial Rogers finished his university career with credit. In 1592 he became vicar of Honingham, Norfolk, and in 1603 he succeeded Lawrence Fairclough, father of Samuel Fairclough [q.v. ], as vicar of Haverhill, Suffolk. In 1605 he became vicar of Dedham, Essex, where for over thirty years he had the repute of being ‘one of the most awakening preachers of the age.’ On his lecture days his church overflowed. Cotton Mather reports a saying of Ralph Brownrig [q.v.] that Rogers would ‘do more good with his wild notes that we with our set music.’ His lecture was supressed from 1629 till 1631, on the ground of his nonconformity. His subsequent compliance was not strict. Giles Firmin [q.v. ], one of his converts, ‘never saw him wear a surplice,’ and he only occasionally used the prayer-book, and then repeated portions of it from memory. He died on 18 Oct. 1636, and was buried in the churchyard at Dedham. There is a tombstone to his memory, and also a mural monument in the church. His funeral sermon was preached by John Knowles (1600?–1685) [q.v.]. His engraved portrait exhibits a worn face, and depicts him in nightcap, ruff, and full beard. Matthew Newcomen [q.v.] succeeded him at Dedham. Nathaniel Rogers [q.v.] was his second son.